Metal pallets have an almost endless list of possibilities with so many different industry applications on the cards. 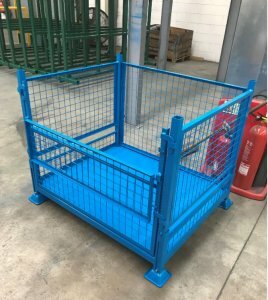 Wire mesh pallets are no exception to this and manufacturing businesses across the UK are continually seeing the benefits. Mesh metal pallets are an effective storage and transportation solution no matter what sector you work in. Typically made for quality British steel or aluminium, they stand the test of time and can remain resilient regardless of the amount of exposure to rough weather and rough handling. At Range Storage Ltd we manufacture metal pallets by hand in our in-house Dewsbury factory and even have our own powder coating facility which is great for custom colour coding you metal pallets for industry use. The first major benefit on Mesh metal pallets is the collapsible side option. In short, this describes how a single side of the pallet can detach and swing outwards. This is very useful if you are working in an environment where goods are stored on a metal pallet and then need to be removed by hand. At Range Storage Ltd we offer a custom metal pallet production service so that you can get a product produced to your exact specs with features most useful to how you operate. Adding castor wheels to a wire mesh metal pallet gives you even more possible as the pallet is made incredibly mobile and also has the goods changeover capability due to collapsible sides. At Range Storage, we use only the finest British Steel for our mesh side slats which guarantees a long service life. Using the right steel is essential as a product with too much carbon steel will be tough but brittle whereas too many alloying elements will cause deformation and bending. 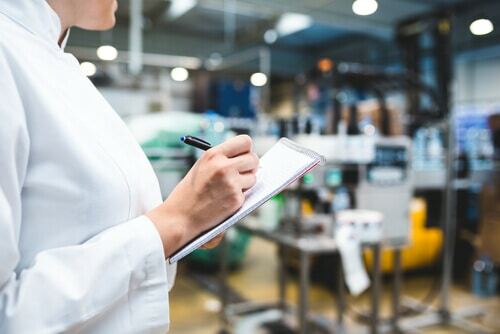 Our local British steel suppliers always supply us with the perfect quality steel.
. Across many industries companies are looking at optimising their processes, saving time and making the production process as efficient as possible. Big improvements are often the result of small changes and employing the wire mesh metal pallets gives a level of clarity. Mesh Metal Pallets- Why Range Storage? You will not find a company more dedicated to quality metal pallet production than Range Storage. Since 1979 we have dedicated ourselves to perfecting the art of metal pallet production and have shipped in excess of around 450,000 metal pallets and stillages. The definition of our success stems from our customer focus as we build our metal pallets to the exact requirements of our customers. This means that they receive a product that has been manufactured to help them specifically in whatever tasks they face. At Range Storage, we also keep every single process in-house at our Yorkshire facility. From the CAD design phase through to the fabrication and powder coating stages, our integrated teams work side by side and are in constant communication.